“Fall Colour Lotuses” is a distinctive, airbrushed silk scarf. It’s prominent features are Lotus blossoms, large leaves and feather images, in orange, yellow, lime green and pale purple. 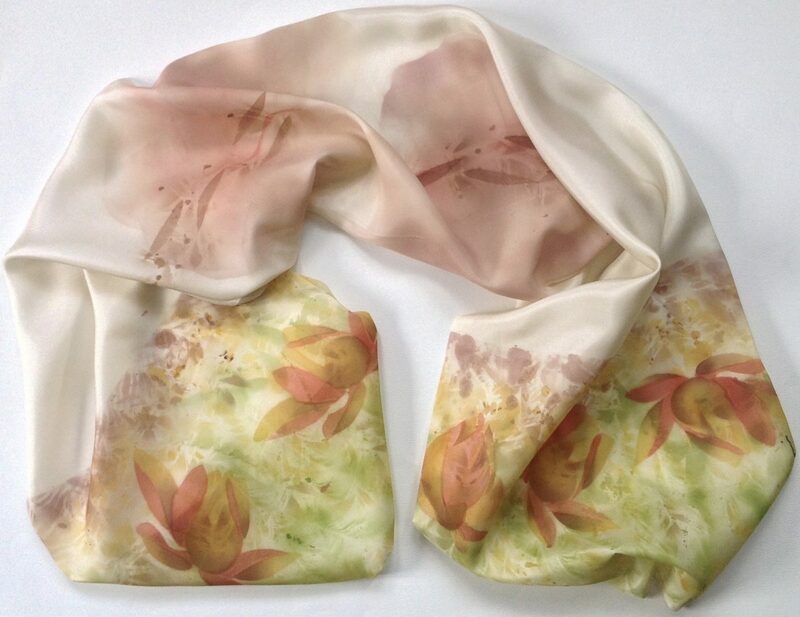 “Fall Colour Lotuses” is a distinctive, airbrushed silk scarf. It’s prominent features are Lotus blossoms, large leaves and feather images, in orange, yellow, lime green and pale purple. 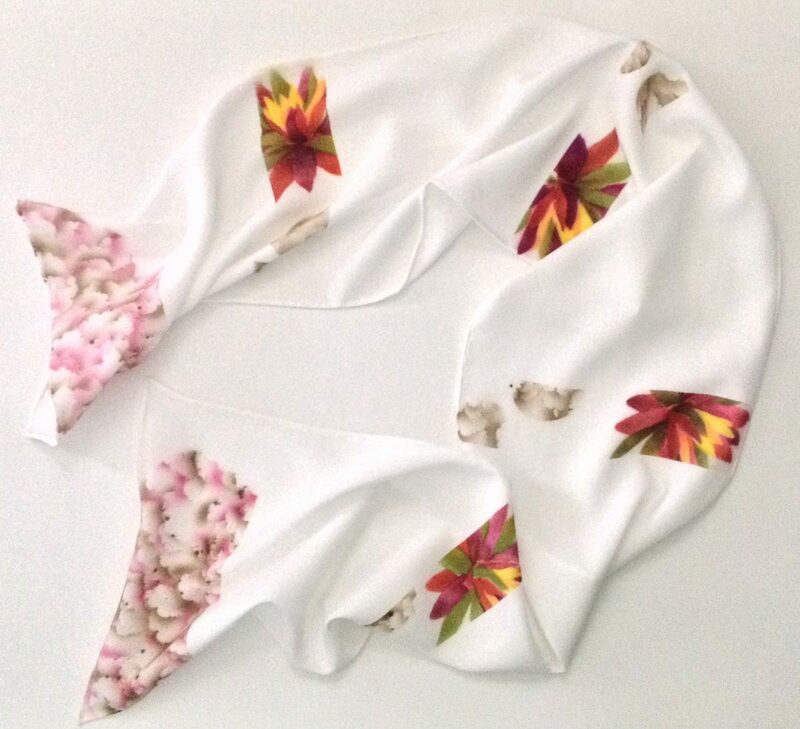 This gorgeous cream coloured, silk scarf measures 140cm x 29cm. Signed by the artist, Maija Zemitis, it truly is a piece of wearable art! Scarves are an inexpensive, feminine and classy accessory any woman can use. Designed in a large variety of colours and styles, using different fabrics (silk, cotton, linen), my scarves enhance any outfit and make compelling fashion statements. I use different fabrics (silk, cotton, linen). Wear my airbrushed scarves in several ways. This silk scarf can compliment a blouse, dress or jacket. My unique, airbrushed scarves can be used in several ways. They are complimentary accessory pieces to a blouse, dress or jacket. Other options are to wear them as head wraps or even as belts. They can be tied in all manner of ways. Scarves enhance any outfit and make compelling fashion statements. It is my hope, that the woman who owns one of my scarves feels that she has an item that is uncommon, something completely exclusive. This is wearable art, that can be worn often and in various situations, whether at work or at play. I expect that she would use my scarf as an expression of her individuality. For many years, my dedication was to printmaking: intaglio, silkscreen and lithography. I studied at Montreal Museum of Fine Art, School of Art & Design and later went on to study Fine Art and Art Education, at University. My main interest, at the time was silkscreen. Following my University studies, I returned to Ontario, where I enrolled in a course in Surface Design at OCA, in Toronto. The printing on fabric was done with silkscreen technique. 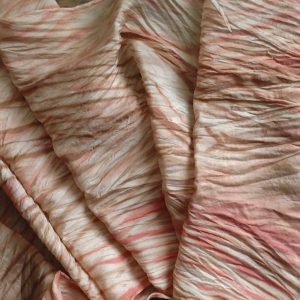 Now, I am working with natural dyes and Indigo shibori techniques. A recent trip to India included a textile tour. I have sought out and interacted with textile artists there. I continue to do so on a frequent basis. Following awe-inspiring trips to Thailand and India, in recent years, my theme of choice is the Lotus blossom. In Hinduism and in Buddhism, the lotus flower represents purity of body, mind, and spirit. 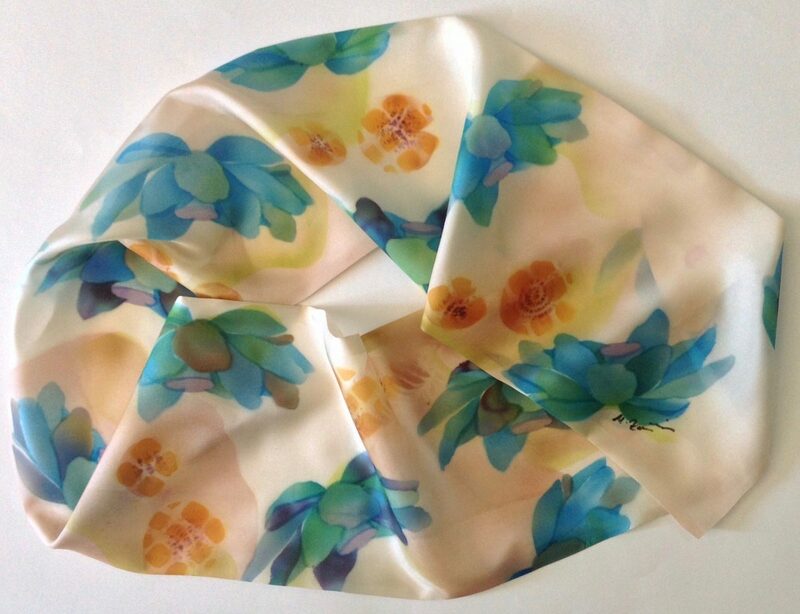 My recommendations to keep this unique airbrushed silk scarf in pristine condition: wash in warm or cold water, with a mild soap, then hang it to dry. Air dry the scarf, then iron it on the unpainted side of the fabric.